News last week that the San Onofre units would permanently shutdown - joining Crystal River 3 (CR3) and Kewaunee as the latest early retirees - and filling in the last leg of a nuclear bad news trifecta. This is distressing on many fronts, not the least of which is the loss of jobs for thousands of highly qualified nuclear personnel, and perhaps the suggestion of a larger trend. Almost as distressing is the characterization by NEI that San Onofre is a unique situation - as were CR3 and Kewaunee by the way - and placing primary blame on the NRC. * Really? The more useful question to ponder is what decisions led up to the need for plant closures and whether there is a common denominator? For SONGs the decision to purchase and install new design steam generators from a vendor working beyond its historical experience envelope. Whether the decision makers understood this, or even imagined that their decisions included the potential to lose the plants, the results speak for themselves. These people were in Black Swan and fat tail territory and didn’t realize it. Let’s look at a few details. Many commentators at this point are writing off the Kewaunee retirement based on the miracle of low gas prices. Dominion cites gas prices and the inability to acquire additional nuclear units in the upper Midwest to achieve economies of scale. But there is a far greater misstep in the story. When Dominion purchased Kewaunee from Wisconsin Public Service in 2005, a PPA was included as part of the transaction. This is an expected and necessary part of the transaction as it established set prices for the sale of the plant’s output for a period of time. A key consideration in structuring deals such as this is not only the specific pricing terms for the asset and the PPA, but the duration of the PPA. In the case of Kewaunee the PPA ran for only 8 years, through December 2013. After 8 years Dominion would have to negotiate another PPA with the local utilities or others or sell into the market. The question is - when buying an asset with a useful life of 28 years (with grant of the 20 year license extension), why would Dominion be OK with just an 8 year PPA? Perhaps Dominion assumed that market prices would be higher in 8 years and wanted to capitalize on those higher prices. Opponents to the transaction believed this to be the case. *** The prevailing expectation at the time was that demand would continue along with appropriate pricing necessary to accommodate current and planned generating units. But the economic downturn capped demand and left a surplus of baseload. Local utilities faced with the option of negotiating a PPA for Kewaunee - or thinning the field and protecting their own assets - did what was in their interest. The reality is that Dominion rolled the dice on future power prices. Interestingly, in the same time frame, 2007, the Point Beach units were purchased by NextEra Energy Resources (formerly FPL Energy). In this transaction PPAs were negotiated through the end of the extended license terms of the units, 2030 and 2033, providing the basis for a continuing and productive future. In 2009 Progress Energy undertook a project to replace the steam generators in CR3. As with some other nuclear plants this necessitated cutting into the containment to allow removal of the old generators and placement of the new. Apparently just two companies, Bechtel and SGT, had managed all the previous 34 steam generator replacement projects at U.S. nuclear power plants. Of those, at least 13 had involved cutting into the containment building. All 34 projects were successful. When it came time to assess how to fix the damage, Progress Energy took a far more conservative and comprehensive approach. They engaged multiple outside consultants and evaluated numerous possible repair options. After Duke Energy acquired Progress, Duke engaged an independent, third-party review of the engineering and construction plan developed by Progress. The independent review suggested that the cost was likely to be almost $1.5 billion. However, in the worst-case scenario, it could cost almost $3.5 billion and take eight years to complete. “...the [independent consultant] report concluded that the current repair plan ‘appears to be technically feasible, but significant risks and technical issues still need to be resolved, including the ultimate scope of any repair work.’"***** Ultimately consideration of the potentially huge cost and schedule consequences caused Duke to pull the plug. Taleb would approve. Southern California Edison undertook a project to replace its steam generators almost 10 years ago. It decided to contract with Mitsubishi Heavy Industries (MHI) to design and construct the generators. This would be new territory for Mitsubishi in terms of the size of the generators and design complexity. Following installation and operation for a period of time, tube leakage occurred due to excessive vibrations. The NRC determined that the problems in the steam generators were associated with errors in MHI's computer modeling, which led to underestimation of thermal hydraulic conditions in the generators. Unfortunately these concerns raised by SCE came after letting the contract to Mitsubishi. SCE placed (all of) its hopes on improving the likelihood of a successful outcome at the same time stating that a design flaw would be “disastrous”. They were right about the disaster part. These are cautionary tales on a significant scale. Delving into how such high risk (technical and financial) decisions were made and turned out so badly could provide useful lessons learned. That doesn’t appear likely given the interests of the parties and being inconsistent with the industry predicate of operational excellence. With regard to our subject of interest, safety culture, the dynamics of safety decisions are subject to similar issues and bear directly on safety outcomes. Recall that in our recent posts on implementing safety culture policy, we proposed a scoring system for decisions that includes the safety significance and uncertainty associated with the issue under consideration. The analog to Taleb’s “central idea of uncertainty” is intentional and necessary. Taleb argues you can’t know the probability of consequences. We don’t disagree but as a “known unknown” we think it is useful for decision makers to recognize how uncertain the significance (consequences) may be and calibrate their decision accordingly. * “Of course, it’s regrettable...Crystal River is closing, the reasons are easy to grasp, and they are unique to the plant. Even San Onofre, which has also been closed for technical reasons (steam generator problems there), is quite different in specifics and probable outcome. So – unfortunate, yes; a dire pox upon the industry, not so much.” M. Flanagan, "Crystal River: End Days of Nuclear Energy?" NEI Nuclear Notes (Feb. 7, 2013). Retrieved June 17, 2013. 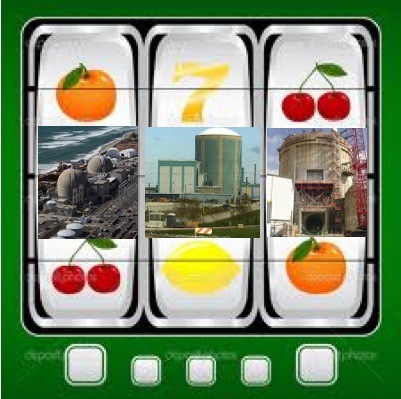 For the NEI/SCE perspective on regulatory foot-dragging and uncertainty, see W. Freebairn et al, "SoCal Ed to retire San Onofre nuclear units, blames NRC delays," Platts (June 7, 2013). Retrieved June 17, 2013. And "NEI's Peterson discusses politics surrounding NRC confirmation, San Onofre closure," Environment & Energy Publishing OnPoint (June 17, 2013). Retrieved June 17, 2013. ** N. Taleb, The Black Swan (New York: Random House, 2007), p. 211. See also our post on Taleb dated Nov. 9, 2011. *** The Customers First coalition that opposed the sale of the plant in 2004 argued: “Until 2013, a complex purchased-power agreement subject to federal jurisdiction will replace PSCW review. After 2013, the plant’s output will be sold at prices that are likely to substantially exceed cost.” Customers First!, "Statement of Position: Proposed Sale of the Kewaunee Nuclear Power Plant April 2004" (April, 2004). Retrieved June 17, 2013. **** R. Trigaux, "Who's to blame for the early demise of Crystal River nuclear power plant?" Tampa Bay Times (Feb. 5, 2013). Retrieved Jun 17, 2013. We posted on CR3's blunder and unfolding financial mess on Nov. 11, 2011. ***** "Costly estimates for Crystal River repairs," World Nuclear News (Oct. 2, 2012). Retrieved June 17, 2013. # D.E. Nunn (SCE) to A. Sawa (Mitsubishi), "Replacement Steam Generators San Onofre Nuclear Generating Station, Units 2 & 3" (Nov. 30, 2004). Copy retrieved June 17, 2013 from U.S. Senate Committee on Environment & Public Works, attachment to Sen. Boxer's May 28, 2013 press release. Having read this piece a couple of times I remain uneasy about the lumping of them into a single cohort and then associating them with Black Swans. It is safe to say that large unwelcome consequences are associated with the respective decisions to retire these plants from operation well ahead of what had originally been planned. But I'm skeptical that the comparative coincidence in time of these decisions, by three very different firms in three very different circumstances, is sufficient to say they reflect a common mode failure in judgment regarding low frequency risks. Perrow described Normal Accidents and gave some criteria for assessment of enterprise circumstances that might be indicative of a proximity to failure by lack of resilience. In the case of Kewaunee the close coupling of financial viability to the short term PPA might support you conclusion that Dominion executives were negligent of low frequency risks - you would know the basis for that better than I. But I've not heard the argument that net-net Dominion will be a loser because their preferred scenario was precluded by a sharp plateau in demand over which they had no control. It would seem inevitable in the merchant generation scenario that these older plants would come to be like older commercial aircraft. That is there departure from service is determined by a host of a factors that have nothing to do with any particular airframe's ability to continue to be flight worthy. If it costs too much to operate compared to some other plane that is available for purchase or lease then the owner's going to pull the plug on costs not on service-ability. With Crystal River the decision to not avail themselves of the proven know-how, if only to spread the risk seems like a bad technical decision - the problem once the first mistake is made is that "putting humpty dumpty back together again" is a very open ended proposition. There doesn't seem to be a sensible recovery path. With SONGS however, the picture seems much murkier. Having read the two Nunn letters to MHI it would seem that the "stretch risk" was right out in the open - and until all the details are known, it seems premature to decide who missed the chance to get it right the first time - or was this a Normal Accident - that after 34 successful S/G replacement projects that "the system" was due for one to go relatively more badly. More importantly, it is far from clear that SONGS encountered a circumstance of untenable technical uncertainty in the way that CR3 did. Perhaps the cost of carrying out a testing based recovery program is too high, and thus abandonment on financial criteria is inevitable. But it seems to me that when NRC tacitly acknowledged the "like for like" replacement decision that it became part owner of the judgment that MHI could get the replacement design right. Thus when problems arose to erode that confidence, I don't see how the public interest is served when regulatory constraints preempt the process of conducting a reasonable technical evaluation. My notion of a resilient National Nuclear Energy enterprise would have had the regulatory flexibility to put the resolution of the SONGS problems into a special oversight case situation at least until there was some performance-based results upon which to make an informed recommendation to all the stakeholders. Perhaps that is all moot given the political situation in SoCAL, but I can't help but wonder "who speaks for the 1100 people who will lose their jobs (plus supplier impacts)?" I'm inclined to be suspect that Taleb's experience in the fast and loose world of arbitrage carries over very well into the situation of these "big iron" plants and their much different stakeholder configurations. Still it would be nice if there were some evidence that this kind of NNE enterprise level thinking were going on within the owners. On the current trend my guess would be that there may be 5-10 plants "on the bubble." Not a good prospect. Bill, thanks for your feedback. With regard to Black Swans (BS) I did not intend to assert these examples meet the rigorous definition of BS’s per Taleb. Rather I suggested they were entering “BS territory” by minimizing the possibility of their occurrence to effectively zero. I think the common denominator among these examples is Taleb’s caution about making decisions based on probabilities rather than consequences. With regard to Kewaunee It is fundamental for any non-rate based plant to have a PPA for some or all of its output to assure a funding stream because demand and the pricing environment is always uncertain. Dominion had that for the first eight years but chose to “go naked” following that. It isn’t possible to know with certainty what their thinking was but it must have included a judgment that demand and pricing would be favorable at that juncture. By all appearances the plant was viable under the 8 year PPA and I have to assume would have continued to be viable under similar terms going forward. The contrast with Point Beach is telling. With regard to SONGS I think I just disagree with your perspective. While I am no fan of recent NRC performance, I do think it is entirely predictable that presenting regulators with a novel, complex and uncertain technical situation is not likely to result in a good outcome. My suspicion is that the Nunn letters were written by the lawyers to lay a foundation for future claims and perhaps to create a perception that SCE was being “prudent” in its management of the contractor. The problem is the consequences of failure extended well beyond the four corners of the contract with MHI. WRT SONGS, I guess my point would be that there is nothing that is so terribly novel, complex, or technically uncertain in the situation with leaky steam generators - NRC has seen many variations on this technical situation before. The fact that there have been 34 replacement projects suggests that there is a goodly range of different technical experiences. What is different is the recurrence of leaks immediately after putting the new generators in service; unless you count the prompt recurrence or CRDM cracking on the Davis Besse replacement vessel head (I would include that in the regulatory basis portfolio of "sensitive unwelcome outcomes previously managed." What is different is having a plant "on the bubble" - not from a cost of power basis - but from a climate of mistrust amongst an aggressive stakeholder/political segment. The employment of the Confirmatory Action Order to control a restart under similar technical circumstances was certainly precedented. This includes the use by NRC staff of its "regulatory discretion" not to force the licensee into a "public hearing before restart" path. If NRC believed this was a sufficient control mechanism, what changed because the ACRS Panel made a very literalistic reading based on inapplicable precedent? Now we hear that NRC may invalidate the rule that is the basis for the Panel's finding, but that seems to be coming a little late. The Nunn letters seem to mean what they say; why not take them at face value - even if they were ineffectively implemented (I don't know what joint efforts actually accomplished)? Obviously there is a lot more to know about how SCE came to spec the replacement generators as aggressively different as appears to have been the case. Unless this was all a very elaborate ruse to dump the plant off the SCE books, it would seem that avoiding premature decisions is something that multiple stakeholders would benefit from being heard about; only NRC could send a signal that if would be open to receiving input from such a broad conversation. I will agree that NRC did a predictable thing; but it was not the only possibility within the range of their authority and relevant precedents. Or so it seems to me.